It all started with a patient who could not accept the fact that her parents were actually her parents. She believed she was someone else’s child in spite of all the evidence to the contrary. In the hope that studying less complicated species might lead to better understanding of humans, Dr. Michael McGuire took some time off to study vervets (a type of monkey) on islands in the Caribbean. From there his journey took him back to humans and to the puzzling questions of what we believe, why we believe what we believe, and how difficult it is to change strongly held beliefs. Establishing what a belief is takes up a fair amount of the book. A seemingly simple definition takes on a much higher level of complexity when we wish to explore how that belief came about and how it is supported by evidence. In addition, there is the issue of what that belief causes a person to do. Dr. McGuire looks at these questions repeatedly throughout the book, drawing widely from history, psychology, religion, and philosophy among other disciplines. The discussion is carried out in part through imaginary dialogue with a philosopher colleague/friend who challenges the ideas set forth and helps refine them. A small divide exists, for example, for a person who believes climate change is real and the evidence offered to support that position; however, if a person is not convinced that climate change is occurring, the belief divide is wide because the evidence is not convincing to that individual. Dr. McGuire illustrates his approach in several ways. One way is to consider the issue of mind and the philosophical positions of monism and dualism. The author admits his bias early in the chapter—he is a monist. What that produces is a set of strong arguments for monism, but very weak arguments for dualism. The belief divide for Dr. McGuire is very small for monism, but very wide for dualism. Unfortunately, that attitude leads to the suspicion on the part of the reader that dualist arguments are given short shrift and discounted (and they are—a number of reasons to believe in a dualist position are not even considered). One very interesting chapter deals with the ongoing discussion between religion and science. Although Dr. McGuire is a behavioral scientist, he readily points out areas where our understanding of basic scientific facts is changing and how religion can be demonstrated to produce alterations in brain chemistry and leads to improved health. This chapter is a refreshingly balanced exploration of issues in the two domains, even though Dawkins, Dennett, and Gould appear more frequently in the bibliography than do those who support the validity of religious belief. The work is well documented with an ample bibliography at the end, although there are no summaries of the articles cited. Often, a statement is made in a chapter and a reference given, but there is no description of the research or analysis of the data used to draw conclusions. 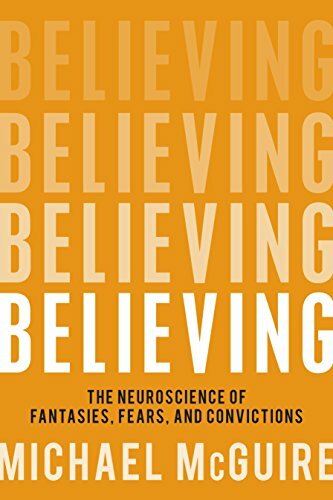 Believing is a challenging (and still unfinished) study of why we believe what we do and how those beliefs influence our behavior. The reader will find much to discuss, debate, and disagree with, but the journey is well worth the effort.